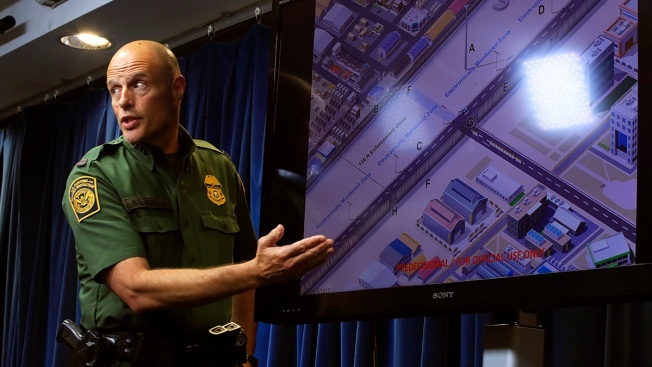 U.S. Customs and Border Protection Acting Deputy Commissioner Ronald Vitiello shows a concept illustration of an enforcement zone of the U.S.-Mexico border during a news conference announcing the selected vendors for construction of the concrete wall prototypes for the border wall, Aug. 31, 2017 in Washington. U.S. Customs and Border Protection announced Thursday it will award contracts to four companies to build four prototypes for the wall. CBP is providing few details of the concrete prototypes and says funding for four other prototypes for a see-through structure will be awarded next week. The prototypes will cost a total of $3.6 million.